Newton, Iowa – It’s not often that one driver will thank another for wrecking him late in a race. But that is exactly what Ricky Stenhouse did after he was rammed from behind as he headed for the finish line in the NASCAR Nationwide Series race at Iowa Speedway Saturday night. That’s because the ram job pushed Stenhouse across the finish line and allowed him to get the second victory of his season and career. 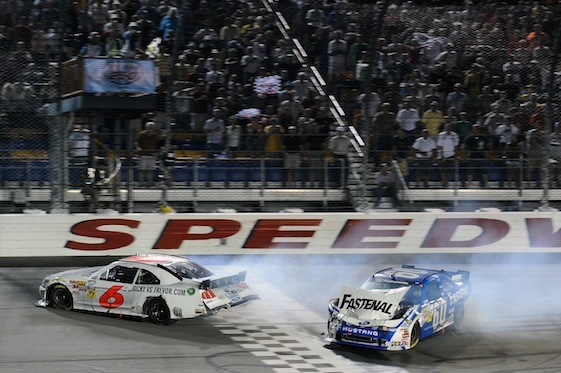 The wild finish was set up when Stenhouse’s engine blew a couple of hundred feet before the finish line. When the power cut, he kept an eye on Edwards in his mirror and admitted to blocking his Roush Fenway Racing teammate. “Believe me, I wanted to (get around) and win the race,” Edwards said. But hit the two cars did, and the impact shoved Stenhouse to a sweep of the two Iowa races this year. Elliott Sadler, who started from the pole but fell back immediately before coming on strong at the end, finished third. Fourth was Josh Wise while Aric Almirola was fifth. Rounding out the top 10 were Reed Sorenson, Kenny Wallace, Steve Wallace, Michael McDowell and David Mayhew, who was making his first NNS start. The final incident between Stenhouse and Edwards was the most dramatic, but it was not the only one. They beat on each other’s doors several times during the 250-lap U.S. Cellular 250. They both complained about the other’s driving on their radios. And all that came a week after they had a run-in at Lucas Oil Raceway in Indiana. Still, they both insisted after Saturday’s Iowa race that they are friends and were just trying everything they could to win. Team owner Jack Roush, who sat with Stenhouse through post-race interviews, said the same thing. And, he said that even though quite a bit of his equipment was torn up Saturday, he faults neither. Stenhouse left Iowa with a 12 point lead over Reed Sorenson. Sadler was third, 29 behind the beaten and battered Iowa winner.